Discussion in 'POTW Collaboration' started by Serebii, Feb 10, 2019. Blacephalon is cool, like all Ultra Beasts, but if it uses Mind Blown (It's special move! 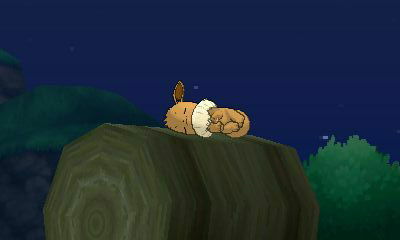 ), it receives recoil and is likely to faint fast, and it saw that outside of Rest, it can't recover itself. Also, How can it drain it's victim vitality ? (It says so in its pokedex description...) it doesnt learn Giga Drain, Leech Life or Dream Eater at all... Mystery there! Puis, Blacephalon share its typing with Chandelure, and Fire/Ghost is cool too! Blacephalon is one of the weaker Ultra Beasts in my opinion. While its special attack is high and Mind Blown has a ridiculous base power, its speed is relatively low compared to other pokémon like Greninja or Tapu Koko, it has very little coverage unlike Kartana, and it is frail, especially when accounting for Mind Blown. It still has some weird niche options, but they're just that, niche, and that Mind Blown can destroy fields of unprepared pokémon in a flash. This is one of those weird options it has for doubles, intended to run next to a Timid Skill Swap Sigilyph. With Timid, Sigilyph should be faster and can Skill Swap Magic Guard onto Blacephalon. With Magic Guard on it, Blacephalon can then try to spam Mind Blown to destroy enemy teams. Magic Guard blocks the self-damage of Mind Blown as well as Life Orb recoil, saving about 60% of Blacephalon's health bar on every attack. Once Sigilyph goes down, you could opt to bring in a Telepathy Noivern. Noivern can spam Boomburst for additional damage (to which Blacephalon is immune) and/or set or reset Tailwind if necessary. There are also other options, like Choice Scarf Typhlosion which benefits from Mind Blown activating its Flash Fire to help its Eruption damage, or Sturdy + Fake Out + Endeavour Jolly Togedemaru (Mind Blown it into Sturdy while Togedemaru uses Fake Out, then Endeavour). It is by no means reliable, Blacephalon is very frail and it's hard to pull off. Blacephalon can Protect while Sigilyph sets up Tailwind, and then use the Tailwind to get a fast Mind Blown off before the enemy can take it out. It is a glass cannon through-and-through. There are pokémon that stop it. Blacephalon is troubled by Incineroar being common, by Tapu Fini, by Milotic, by Tyranitar. All these are quite bulky on the special side, resist fire, and have super effective STAB moves to eliminate Blacephalon. Blacephalon doesn't have the coverage moves to deal with such threats at all. Trick-Scarf Blacephalon can also work. The Scarf helps it in its glass-cannon-esque role of attacking before being hit, and it is faster than most other pokémon that frequently run a Choice Scarf like Tapu Lele, Landorus, and so on. The idea is to either spam Mind Blown until you go down (which is after two attacks), acquiring a Beast Boost for the second hit to hit harder as you go down and traded one pokémon for two enemies, or Trick the Scarf to a wall like Toxapex or Chansey to cripple them. Down with Blacephalon! This clowny UB dares to infringe on the beauty that is Chandelure? What with its greater special attack and speed making it a terror offensively?... Ok that plus Beast Boost makes Blacephalon a terrifying late game cleaner... Really the only things that Chandelure has going for it is greater bulk and reliable access to grass moves, which is really sad for Blacephalon. Late game sweeper Blacephalon. Come in when your opposing team is weakened and checks are dealt with and steam roll them into the ground. With Choice Scarf, Blacephalon also functions as an excellent revenge killer. And with each Beast Boost, Blacephalon becomes even stronger, turning into an overwhelming first rather quickly. Flamethrower and Shadow Ball are rather evident, being reliable STAB moves. Overheat is good if you need a bit of instant power in a pinch. Last move is up to preference. Psyshock provides minor additional coverage, but does severe damage to sponges with significantly more SDEF as opposed to DEF. Otherwise it is your hidden power of choice. Hidden Power Water takes care of opposing Fire and Rock types, while Hidden Power Ground gets both Fire and Rock. Entry Hazard Control -Blacephalon loathes entry hazards, being vulnerable to all of them, include a weakness to Stealth Rock, limiting Blacephalon's pivoting. Zapdos, Landorus-T and Rotom-Wash are all decent choices, having Defog to remove entry hazards and pivot in on the Earthquakes that Blacephalon invites. Rotom-Wash is especially apparent, being able to pivot in and destroy opposing Water (and to a lesser extent Rock) types. Entry Hazard Setup -Like any sweeper Blacephalon loves entry hazards hurting its opponents, turning 2HKOs into OHKOs, slowing down faster threats, breaking Focus Sash/Sturdy. Fairy types - Fairies resist Dark moves like Knock Off and Pursuit, both of which being death sentences for Blacephalon and are able to easily dispatch Tyranitar and Ash-Greninja, two of Blacephalon's greatest counters. Tapu Bulu is especially good, offering healing, reducing earthquake damage, and dispatching Water types with ease as well. Tapu Fini gets special mention due to Defog and able to wall opposing water types as well (plus the Water/Fire/Grass triangle is proven to be a solid pivot set). Fairies in turn enjoy Blacephalon's ability to nuke Steel and Poison types (not name Alolan Muk) to the ground with its Fire moves and Psyshock respectively. Down with Blacephalon! This clowny UB dares to infringe on the beauty that is Chandelure? What with its greater special attack and speed making it a terror offensively?... Ok that plus Beast Boost makes Blacephalon a terrifying late game cleaner... Really the only thing that Chandelure has going for it is greater bulk, which is really sad for Blacephalon. Late game sweeper Blacephalon. Come in when your opposing team is weakened and checks are dealt with and steam roll them into the ground. With Choice Scarf, Blacephalon also functions as an excellent revenge killer. And with each Beast Boost, Blacephalon becomes even stronger, turning into an overwhelming first rather quickly. Flamethrower and Shadow Ball are rather evident, being reliable STAB moves. Overheat is good if you need a bit of instant power in a pinch. Last move is up to preference. Psyshock provides minor additional coverage, but does severe damage to sponges with significantly more SDEF as opposed to DEF. Otherwise it is your hidden power of choice. Hidden Power Water takes care of opposing Fire and Rock types, Hidden Power Fighting gets Dark, Rock and Tyranitar, while Hidden Power Ground gets both Fire and Rock. Blacephalon does get Pain Split. While not a true recovery move, it is something. If you want to use it, you will have to make sure that Blacephalon can either OHKO an opponent or survive a counterattack if Mind Blown doesn’t KO. Yes, you're right! I forgot Pain Split. Maybe I checked the moves list too fast, but yes, it can work at times! Background Information - The Well-Mannered Exploding Head Clown Vampire Ghost? Blacephalon is called the Fireworks Pokemon and this gentlemanly ghost Pokemon surprises it's prey by exploding it's head and absorbs their vitality... huh... kind of like a vampire. Makes you wonder how GameFreak came up with this unique Pokemon. 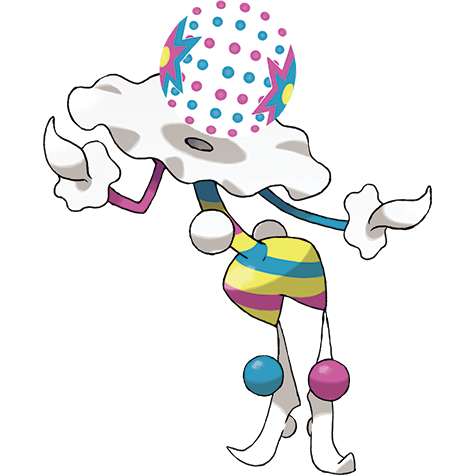 Blacephalon's most well-known debut is actually not the anime or the manga but made it's first appearance in one the USUM trailer as one of the brand new Pokemon to market the USUM games. For many this was quite a surprise as previously they only did new forms and Mega Evolutions in "third versions", not new Pokemon. 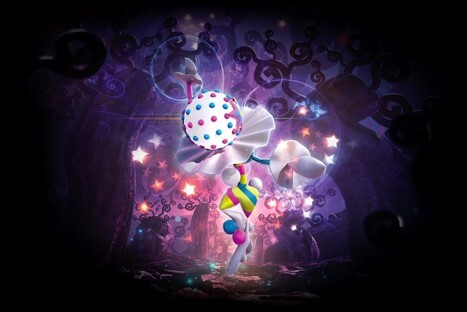 Interestingly, while Blacephalon's homeworld has never been shown in the games, it's actually has been introduced in the Pokemon TCG as some kind of Tim Burton-esque cartoonish horrorland full of darkness and bright colorful stars. 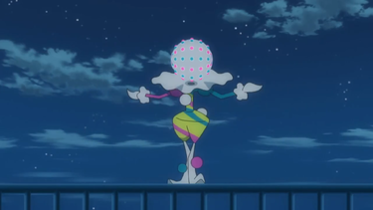 In the anime, Blacephalon makes it's appearance as the Halloween Pokemon, doing a lot of stunts and tricks to it's natural enemy, Xurkitree the Christmas Pokemon. Jokes aside, it was a pretty cool episode. Finally in Pokemon Adventures, Blacephalon entered the scene as one of the invading Ultra Beasts, fighting none other than a Mismagius belonging to Anabel of the Interpol, or as some of you may remember Salon Maiden Anabel of the Hoenn Battle Frontier. One of the coolest things about this Loki-esque take on Blacephalon is it how behaves in a fight, taunting and tricking the enemy with it's exploding head and then bowing down like a gentleman. Finally here's an interesting fact about Blacephalon. So it turns out Blacephalon can learn the move Magic Coat by leveling up but cannot actually learn it through move tutor. Blacephalon has one of the most intimidating offenses and with Mind Blown, he's just as intimidating in doubles. The downside is that Mind Blown takes half of your HP, so use it as a last resort. However it is possible to use it three times with Tapu Bulu's grassy terrain on the field. With trick, most effective with Choice Specs against a physical attacker, you can ruin a physical attacker's momentum with this. However for some, Hidden Power Ice might be better coverage against Dragon-types or Hidden Power Grass against Ground, Rock or Water types. Skill swapping the ability Magic Guard onto Blacephalon gets rid of Mind Blown's 50% health cost allowing Blacephalon to explode it's head as much as it desires too. Heck, if your running Choice Specs or Choice Scarf, Mind Blown is really the only move you can depend on. The rest of his moves are really just opportunities presented in the Pokemon battle with Focus Sash or really any of the items that aren't the Choice items to maximize Mind Blown's efficiency even further. Hidden Power Ice and Hidden Power Grass are also other options to consider against rock, water and dragon types. Though for some a little more extra bulk such as Light Screen isn't a bad idea either. Not only that, you'd essentially be giving away your Beast Boost ability to a different Pokemon which adds even more opportunities to other fast hard-hitting Pokemon in doubles such as Alakazam or Gallade. Perhaps in doubles. I don't think the damage output is sufficient in singles to justify it. And for Royals, I personally don't think it's all that good in Royals no matter what you do, it's just too frail, not quite fast enough to get away with that frailty, and its Mind Blown damage output is cut too much in Royals. Perhaps in doubles. I don't think the damage output is sufficient in singles to justify it. Still sounds like a fun set worth looking into.